Chief of General Staff of the Slovak Armed Forces Lieutenant General Daniel Zmeko visited the Czech Republic on 12th September, and met with the Czech Chief of General Staff Lieutenant General Aleš Opata and with the Minister of Defence Lubomír Metnar. 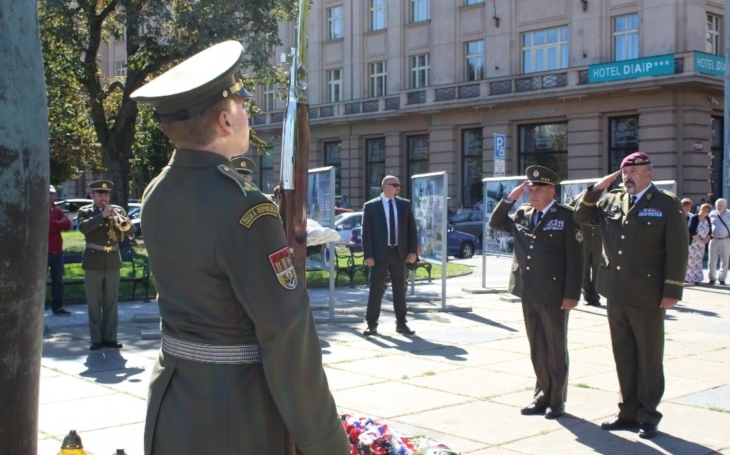 Both generals laid wreaths at the Monument to fallen heroes on Vítězné square (Square of Victory) in Prague. Talks on strenghtening the cooperation between the Czech and the Slovak army followed, with the main subject being common exercises and education, possibilities of Special Forces developement, and also participation of the troops during the 100th anniversary of the Czechoslovak independence (28th October 1918). “The cooperation between the Czech and Slovak army is, among the Coalition partners, one of the most intensive. It is based on common historical roots, similar mentality, language and culture,” Lieutenant General Opata said. The Czech and Slovak Republic cooperate closely in developement of defence capabilities. There are shared projects worked on by both the Czech and Slovak professionals, common exercises and cooperation during foreign deployments. The generals also discussed common modernization projects concerning especially the rearmament process and developement of ground forces. Another important subject was the exercise activities for the nex year, participation of the V4’s (Visegrád Group, Visegrád Four: Czech Republic, Slovakia, Poland, Hungary) troops within the EU Battlegroup (EU BG) lead by Poland in 2019, and detachment of troops for the NATO Response Force (NRF) and the Very High Readiness Joint Task Force (VJTF). The main exercise held by the Slovak Army next year will be the Slovak Shield, attained by the V4 countries and other foreign partners. The recent edition starts today. Around 1,500 Slovak and allied soldiers (including the Indiana National Guard and personnel of the U.S. Army Europe) are expected to participate between 14th and 28th September. The exercise is considered to be one of the most significant military exercises in Central Europe. A major aspect of the Czech and Slovak cooperation is represented by the concluded treaty on mutual protection of airspace. Under the treaty, if one of the countries is unable to protect its airspace, the other will assist. The treaty also allows pilots to interfere over the territory of the other country, using weapons when necessary.